By LUDWIG VON KOOPA - KoopaTV's end-of-month game endorsements. Nintendo gamers (in North America), we got an amazing last two weekdays of August. Today, Thursday the 28th, the beloved Donkey Kong Jr. Math comes out on the Wii U Virtual Console in North America for $5. Tomorrow, Friday the 29th, Professor Layton vs. Phoenix Wright: Ace Attorney is finally released in North America on the 3DS for $30. In both digital and physical distribution! KoopaTV heavily, HEAVILY recommends you purchase both games if you can. Please, do not choose between the two. They go together (as you'll see below)! Last time you checked, I have no experience with the Professor Layton series. Well, that's still true. Professor Layton vs. Phoenix Wright: Ace Attorney will be my first exposure to the series! 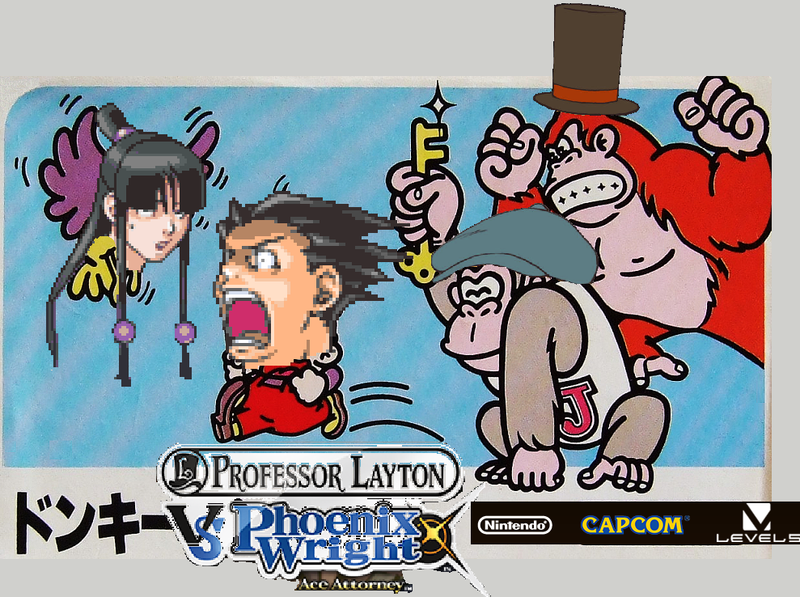 I have very, very strong experience with Phoenix Wright: Ace Attorney and Donkey Kong Jr. Math, however. I'm going to guess that about 20% of KoopaTV articles incorporate Ace Attorney in some way, an amount only matched by Super Smash Bros.! That's like, one direct or indirect reference every week. And I was the first and most enthusiastic Let's Player of Donkey Kong Jr. Math on YouTube! That game changed my life, causing the Division fad to be born. Which spawned its own Planet Koopa board, along with directly leading to the creation of Jessie Go Jr. Remedial Algebra. I'm writing to alert you of the massive negative impression of the brilliant Nintendo-published game, Donkey Kong Jr. Math. As a devoted fan of Donkey Kong Jr. Math, it is completely mind-boggling how people can criticize the game. I have made a cult about its number one best feature, Division. Division is a truly brilliant feature, but not many other people seem to agree outside of the cult. Please assist our cause in promoting the many merits of Donkey Kong Jr. Math by listing, in the public relations magical way, said merits of Donkey Kong Jr. Math. It would be a great boon to our cause of awareness of this awesome game if an official Nintendo employee were to officially state the excellency of Donkey Kong Jr. Math. It would also help Nintendo make money off of this game, so everyone benefits. Did you know the Wikipedia page for Donkey Kong Jr. Math actually advises people not to purchase it by citing endless amounts of negative reviews and not a single positive one? I'm so devoted to Donkey Kong Jr. Math that I created the only Let's Play Donkey Kong Jr. Math on Youtube (under the name "PrinceofKoopas"), with the purpose of advertising the game and breathing new life into peoples' perspectives of it. All for the purpose of giving the game the proper respect it deserves and for Nintendo to receive more money off of Donkey Kong Jr. Math. It'd be epic if Retro Studios worked on Donkey Kong Jr. Math Returns after the epic job they did with Donkey Kong Country Returns, but I know you're not allowed to accept unsolicited game requests. I know the game came out 25 years ago but it was released on the Virtual Console 3 years ago and on Animal Crossing 8 years ago (Animal Crossing is how I play it...regularly) so it should still be fresh on your minds. Thanks for contacting us about Donkey Kong Jr. Math. I can certainly understand your thoughts on this matter and want you to know how much we appreciate you sending them in. I also want to assure you that your comments will be added to our records for this game and made available for other departments at the company to use as they see fit. Please note that video games, like movies, are judged differently by different players--what sparks the interest of one player may frustrate or bore another. A game's development team makes many decisions to appeal to the target audience, be true to the source material (if applicable), and deal with possible hardware limitations. They do their best to balance these issues to bring gamers the best experience possible. Having said that, we do appeciate your taking the time to share your concerns with us. While we can talk about how Nintendo of America employees don't use spell-check ("appeciate"? ), their response was great. It took them a few years (and Retro Studios ended up making Donkey Kong Country: Tropical Freeze instead) but Donkey Kong Jr. Math HAS returned! Meanwhile, I do not know what Professor Layton is a professor of, but for the purposes of this article it is math. Maya Fey! Pay attention to Professor Lay Kong! I know Donkey Kong Jr. Math is a masterpiece. I have very high hopes for Professor Layton vs. Phoenix Wright. After all, it was supposed to come out a year ago in America. Not sure what happened there. Either way, since it's finally arriving, it's the next thing I'll spend my time with! Oh, sorry Fire Emblem: Awakening. You'll have to stay in my backlog for quite a bit longer. As Chrom would say, "I suppose I'll get my chance... another day... ugnh ugh." Update: We would like to note that the part of the Let's Play Donkey Kong Jr. Math with the infamous "DIVISION" clip came out exactly 5 years ago, August 28 2009. Nintendo truly has honoured Donkey Kong Jr. Math today. Update 2: My minions have brought me Professor Layton vs. Phoenix Wright: Ace Attorney! So you should get your minions to buy you it, too. Or you could get it. Good job. I'll be taking that now. Ludwig will physically purchase Professor Layton vs. Phoenix Wright: Ace Attorney as soon as he can. Meanwhile, he'll stick with his Animal Crossing copy to play Donkey Kong Jr. Math. What will YOU do? For a review of the last Ace Attorney game out in America, click here. For Ludwig applying his love for division on KoopaTV, click here. Exactly a year after this article was published, Ludwig finally did start playing Fire Emblem: Awakening! Professor Layton ain't the only math professor out there. If he is one at all. There's the professor at Big Brain Academy on the Wii U Virtual Console! But math shows up in puzzles, so it works. So he's like Jackie Chan? ....I didn't know Jackie Chan had anything to do with archaeology. He's just a simple archaeologist.